There is barely a single tree here, but nearly everyone today voiced some version of the famous philosophical puzzle about the observer and existence. Or coexistence. 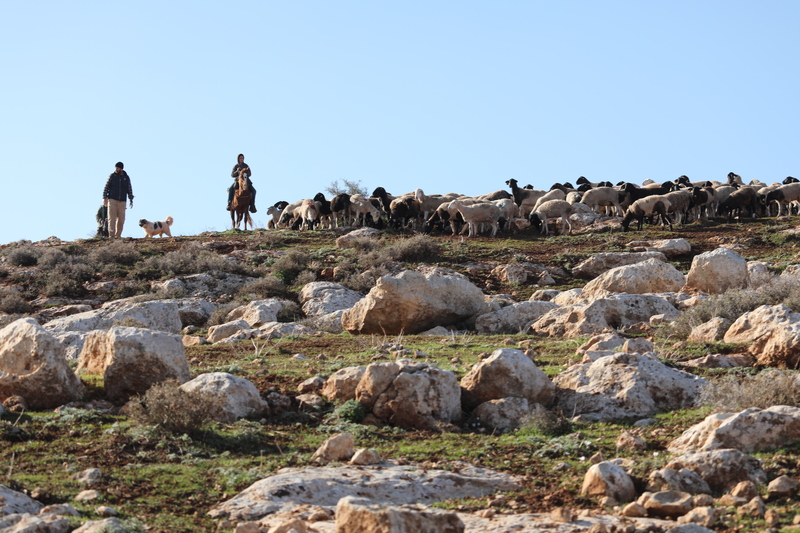 Now, from a high ridge, Israeli shepherds with their flocks often watch Bedouin shepherds with theirs below. 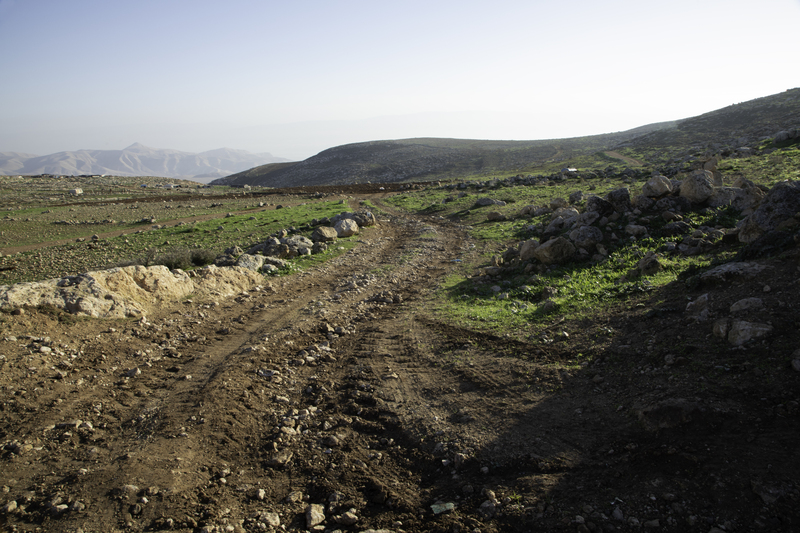 The army tries to be “fair.” A quiet road was briefly the focus of an attempt to divide the land between the settlers and the Bedouins. When this effort failed the army decided to expel everyone equally from the firing zone. 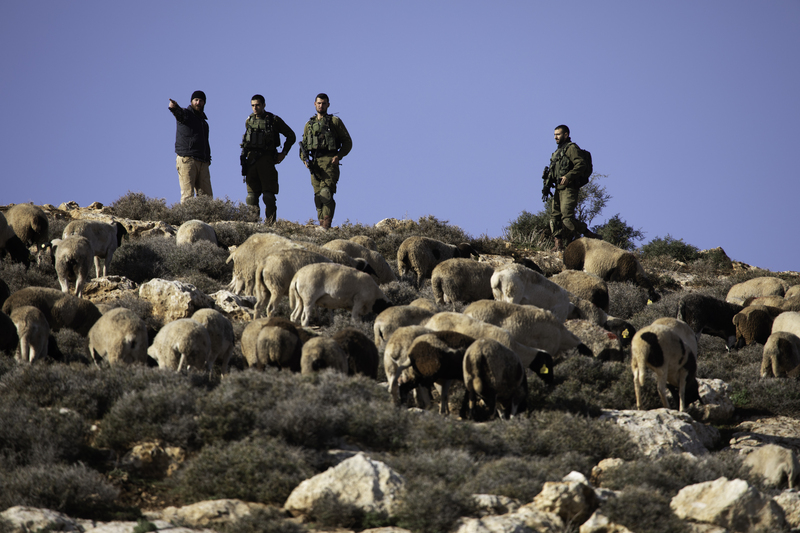 This means that if the two groups are grazing at the same time, the settler shepherds will move their own flocks just out of the zone and call the army. 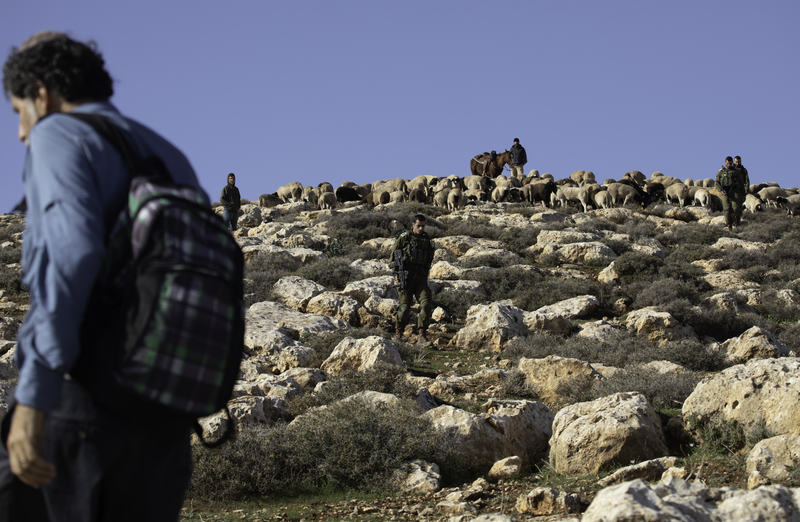 After the army expels the Palestinians, the settlers can return with their flocks undisturbed. 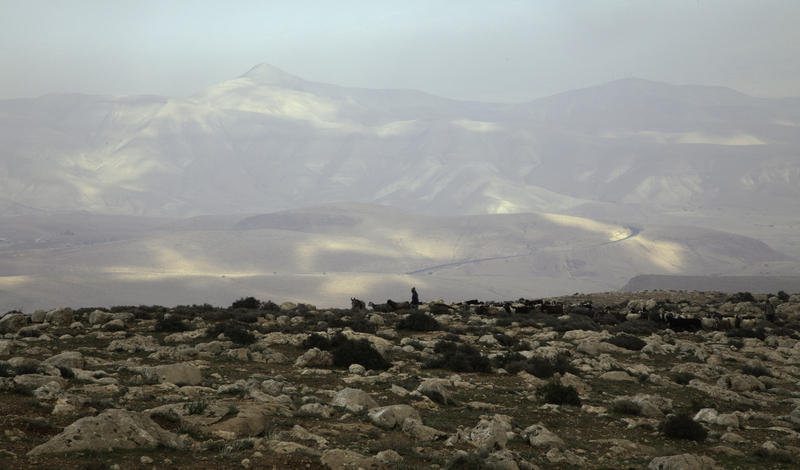 Our mission for today is to help the Bedouins move safely past the one place where they can be seen by settlers. It worked perfectly yesterday. Today, not so much. For a while, everything goes easily. We walk to meet the sheep, content to nibble, and their equally placid minders. Eventually, the settlers and their herd appear on the ridge. From a distance it is hard to distinguish one group of shepherds from another. At first it appears that they will be satisfied just to gaze down and know that they have the upper hand. Michal approaches them. When I join her, she tells me that the shepherds are annoyed because one of the sheep dogs has taken a liking to her. He is not a good herding animal, she laughs. 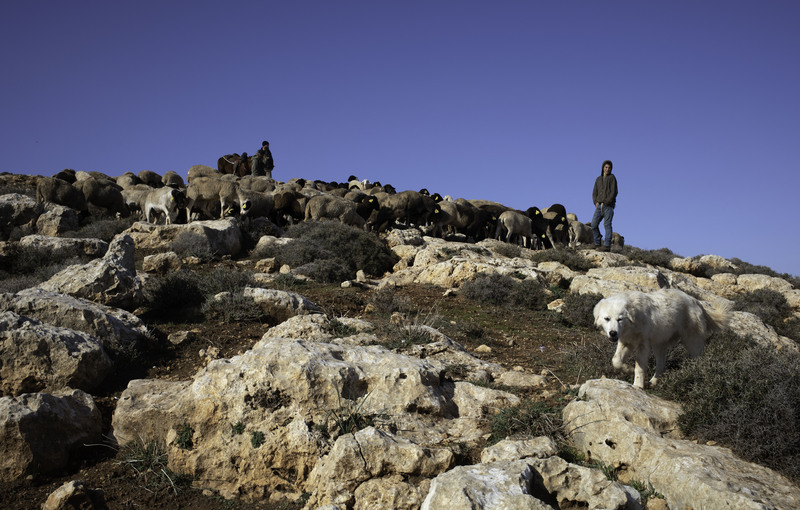 I add, and Michal agrees, that were he here our friend David might have something to say about the dilemma of a sheep dog who can’t tell the difference between settlers, Palestinians, Bedouins, or activists. But of course, to know this kind of difference is part of the dog’s job. I see one of the settlers on the telephone. Sure enough, a little while later, a jeep appears on the hilltop. The soldiers are bored and aggravated. When they are prevented from doing their job in the simplest and most literal way, involving the fewest steps, they can find it annoying. 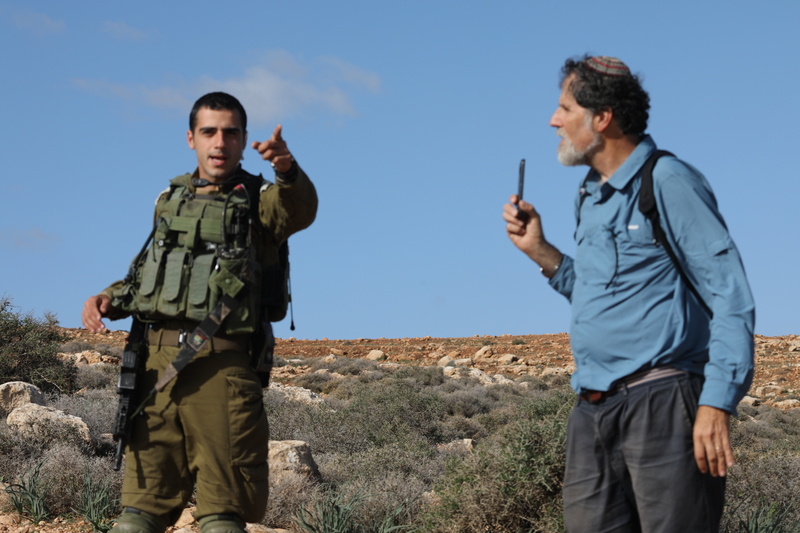 The Palestinians must leave the area, explains the officer. And yes, the settlers will also have to leave. 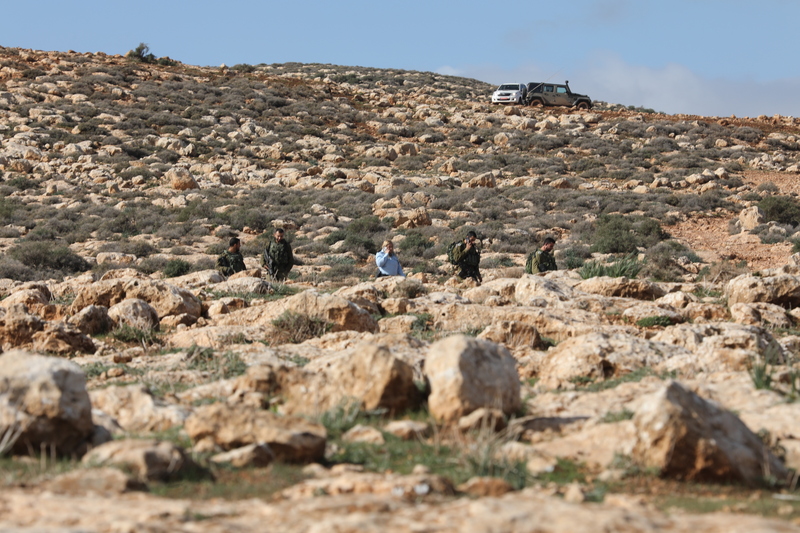 The officer climbs back up the hill; the Palestinians disappear; but the settlers of course stay put. We remain to confirm this, and the officer returns to us. See, he says, they must be in the valley just below. There’s their dog. 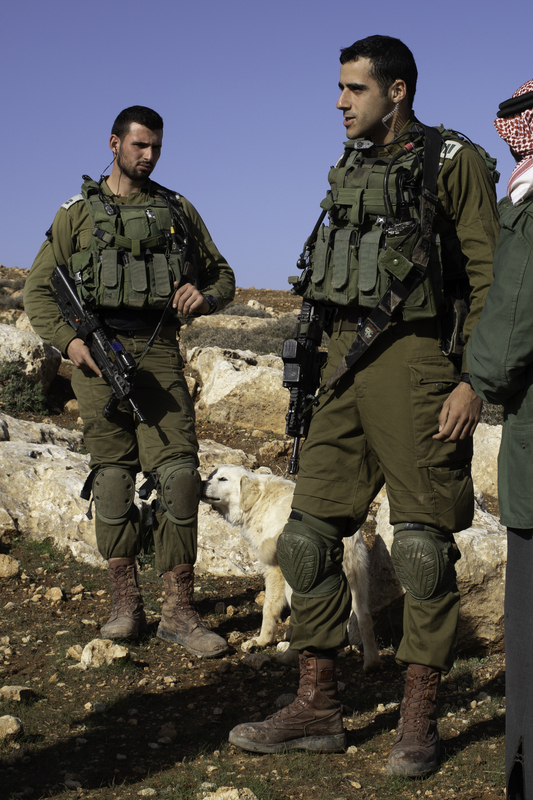 None of us see the Bedouin’s dog, although all this time the friendly settlers’ dog is trying his best to get acquainted with one of the soldiers. The officer threatens that he can up the ante. I can call the police, he says. 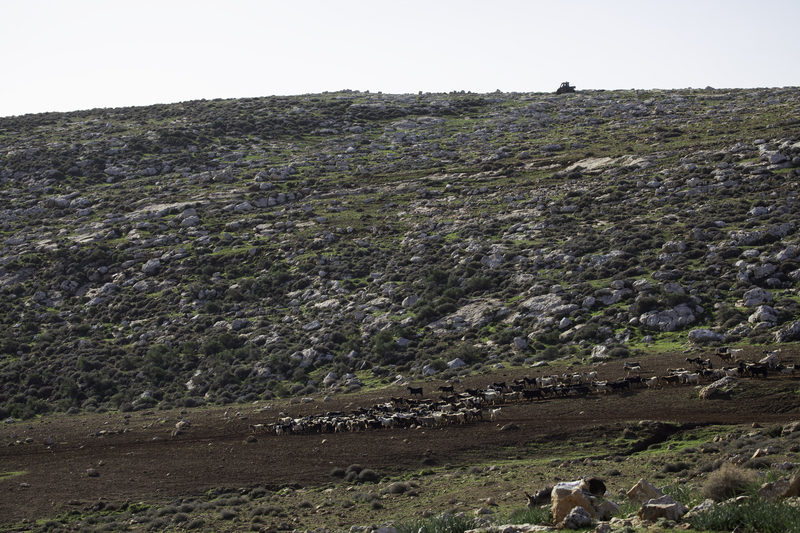 Below the ridge, the Bedouins have decided not to return home right away. 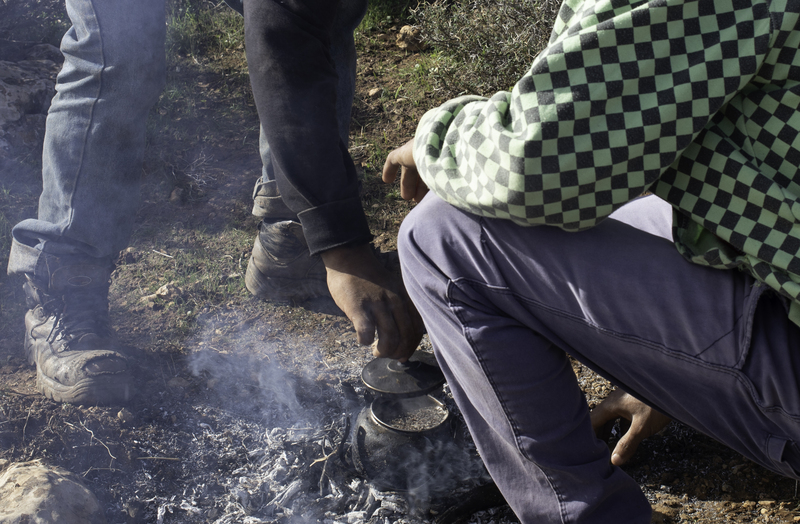 As we drink their tea, Arik speculates that they make it to claim their land. And also, I say, so that they can live their lives. Arik adds that they want to hold on to their dignity. Whatever their reason, none of us are allowed to enjoy our respite for long. By the time I have gulped down my tea, a new contingent of soldiers is back. The soldiers are angry. 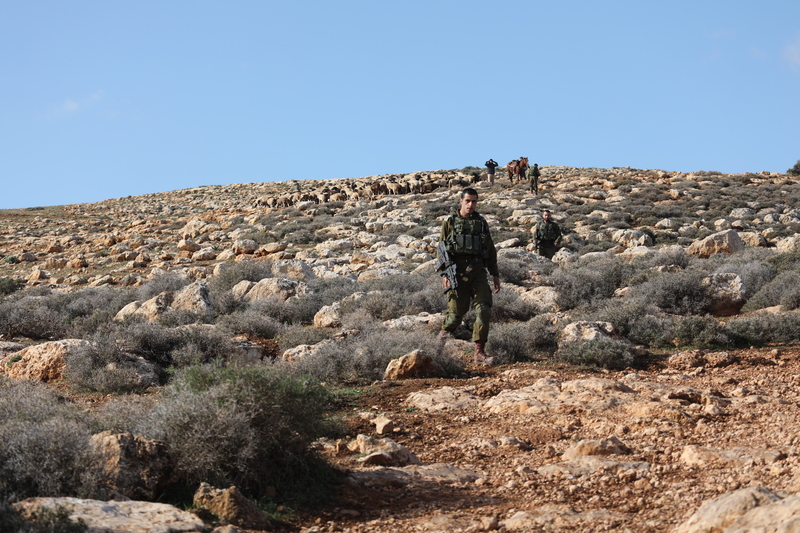 Having to shuttle back and forth between us and the settlers (still high up on their ridge in the firing zone) has tested the endurance of the officer. But today they have to reckon with Abu Jibril, whose endurance more than matches theirs. While he does not usually join the herd, he is also more determined, more invested, and more willing to express anger than the others. 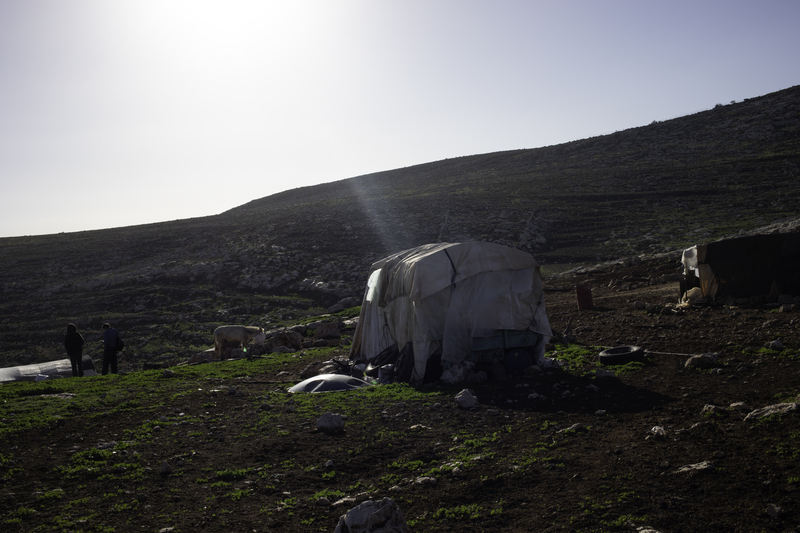 As he has been telling us all morning, Abu Jibril remembers every day of the 50 years that the community has lived here, and the period of unrest that drove them here in the first place. Eventually, we all leave. The soldiers follow us out. The Bedouins want to rethink this situation. They cannot continue the daily aggravation. They do not want to be dependent on Ta’ayush. They want their lives back. 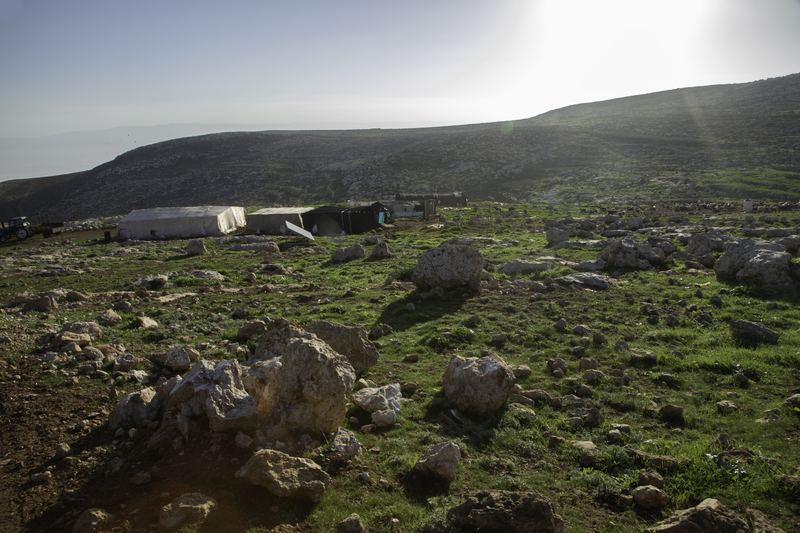 Ta’ayush has been to Ein Rashash every day since. This week Rita and I are with Arik, Guy, three young women from Operation Dove (an Italian NGO), and two filmmakers. Alon and his assistant are making a film about the occupied territories, and Guy and Arik are miked. 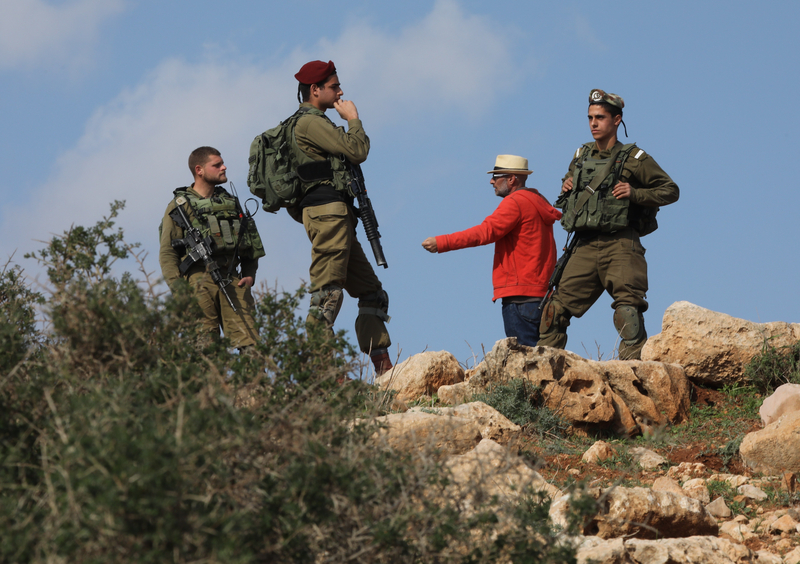 When the soldiers first suggested calming the situation with an agreement dividing grazing land between settlers and Bedouins, the Bedouins rejected the offer because they did not see why any of their grazing land should be reserved exclusively for settlers. A few days ago, however, the shepherds asked for an informal, non-written agreement. The soldiers countered that they would just let everyone graze, as long as no problems arose. Arik interjected that the settlers are the ones who need to hear this. 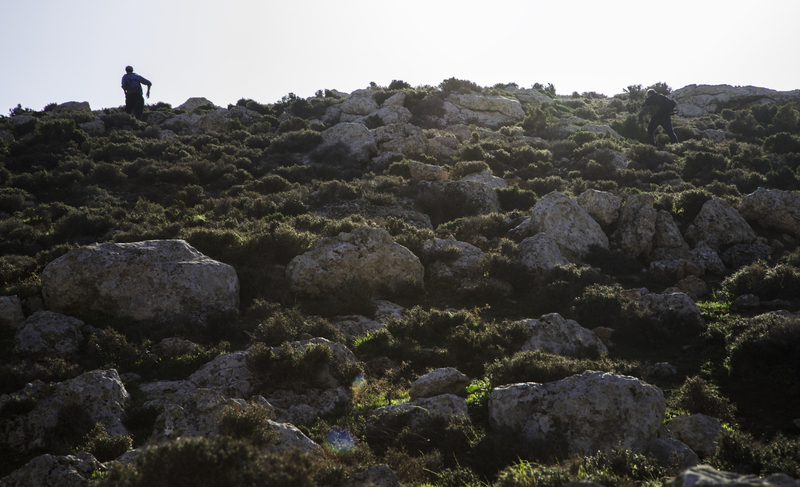 The settler Elchanan descended to meet them, according to Arik, He and Elchanan talked past each other for a long time. 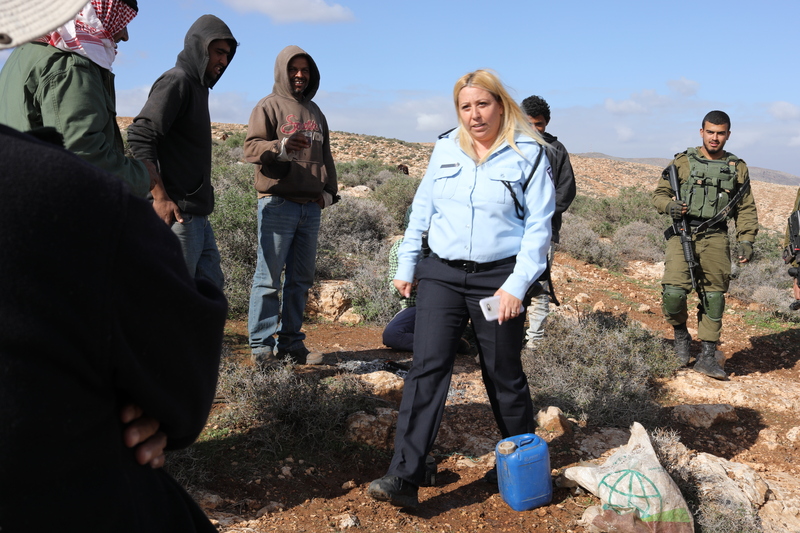 The settler mouthed the usual nonsense about Bedouins: they are always trying to steel sheep; they attack settlers with stones; they are a danger to the community. And we are the provocateurs that instigate all the trouble. 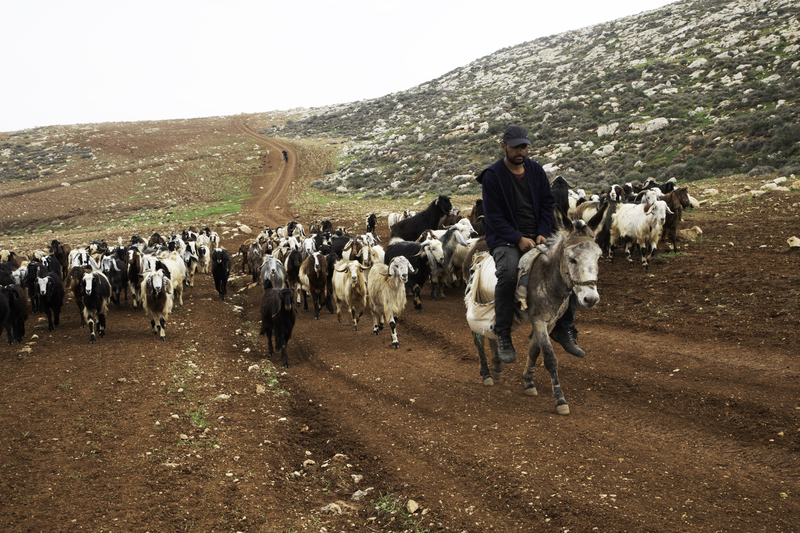 When Elchanan left, Arik and Guy and the others planned to split up, following separate Bedouin herds. There are now about four of them, including Mohammad’s, which has just become visible to Rita and me in the valley. But soldiers show up before the plan can be implemented. 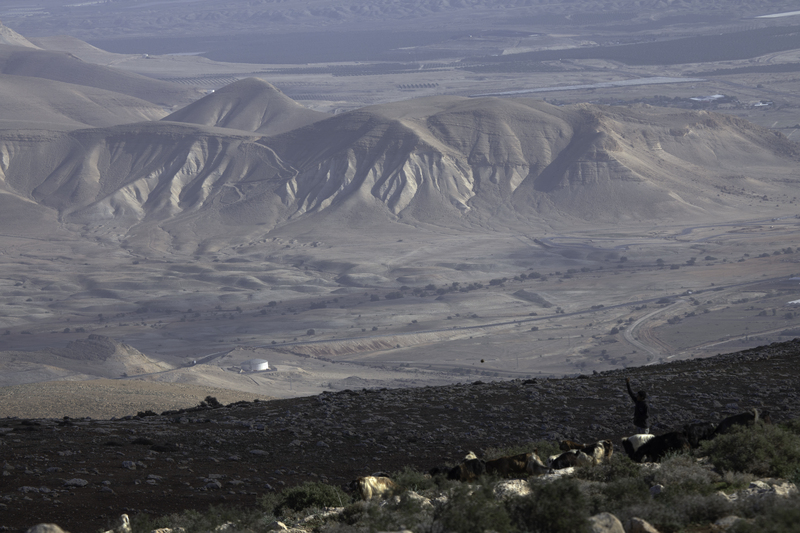 By this time, no Bedouins are in sight. Arik has alerted us about the soldiers and asked us to tell them to move their flocks farther away, so they have quickly made themselves scarce. No tea today. Rita and I recline and blissfully enjoy having the view all to ourselves. Then we come to our senses. 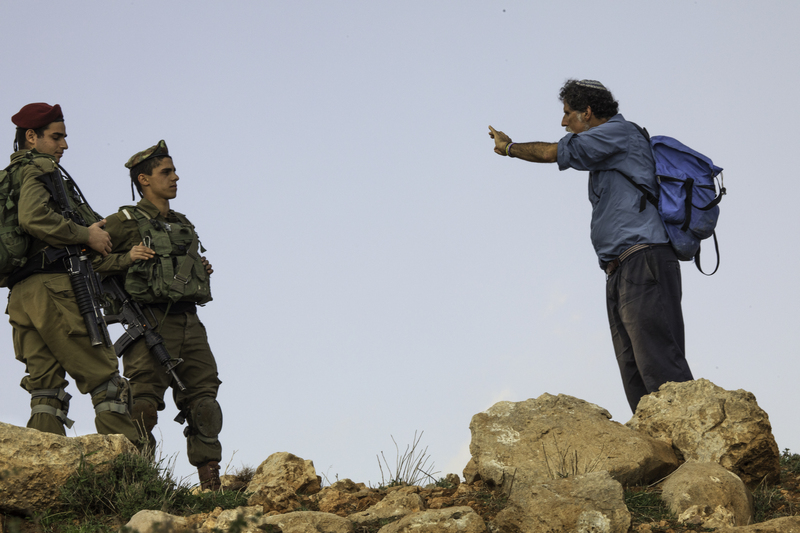 When we join the activists, the soldiers, and the filmmakers up at the pass, they are deep in conversation. 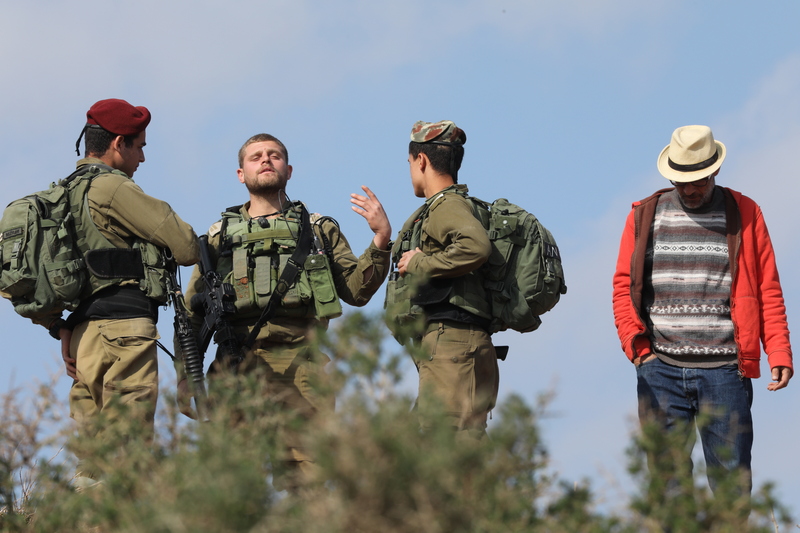 The soldiers – they are different ones than last week – think they are there because someone has complained about the settlers, so naturally their first thought is to expel the activists, who are, after all, always grumbling. 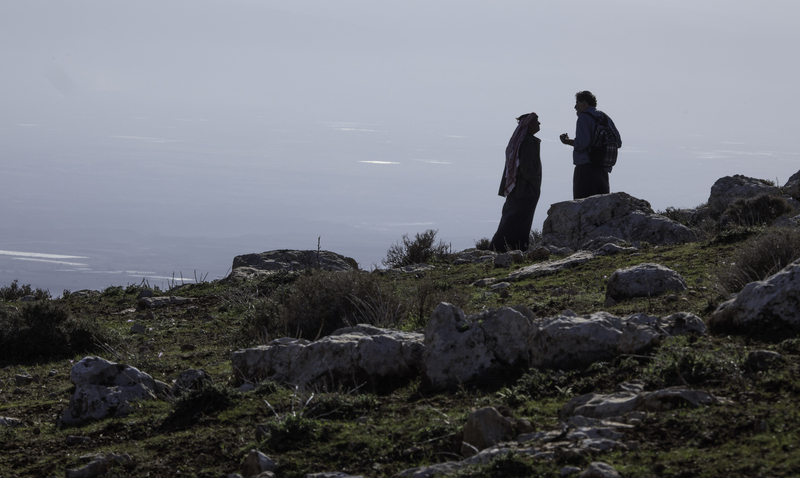 But with no Bedouins in sight, there is time to talk. They request that we refrain from photographing them, and briefly we acquiesce. When I see the filmmakers’ camera running, however, I retreat down the hill and photograph the conversation with a long lens. Guy and Arik take on the job of explaining the deep history of the dispute to the soldiers. I catch a few phrases. Arik evokes Nuremberg – perhaps they have told him they have their orders (?) From Guy I recognize common Hebrew expressions I have learned from him, like טיהור אתני (ethnic cleansing) and מריונטות (marionettes – his word for obedient operatives of the Civil Administration). 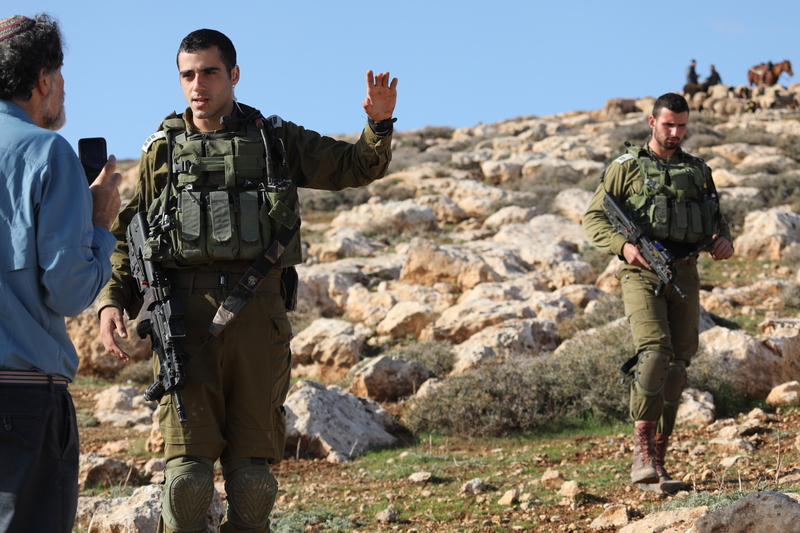 The soldiers challenge these characterizations but they do engage with the activists. 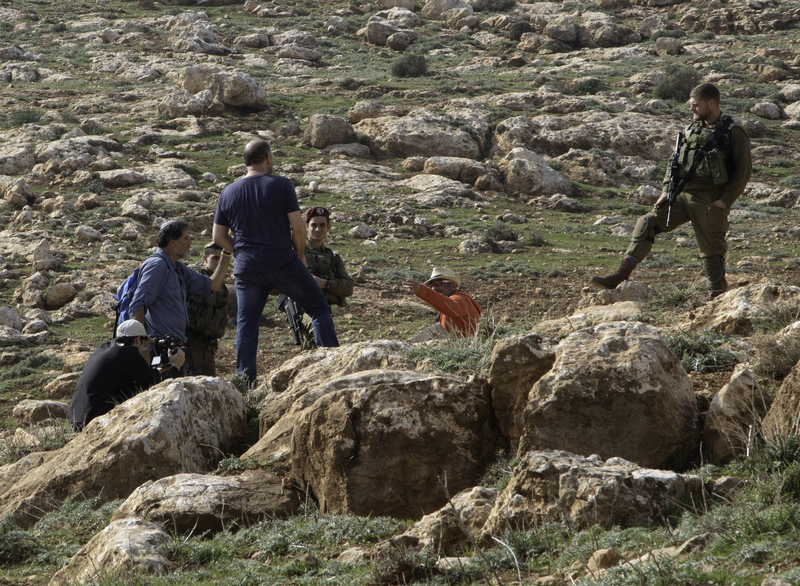 Eventually, for whatever reason, because the officer recognizes the absurdity of what the soldiers are doing, because there are still no Bedouin to be seen anywhere, or because of the mutual respect that has somehow developed between the officer and the activists, he calls the commander and reports that there is no conflict here and they all leave. It is a little victory. 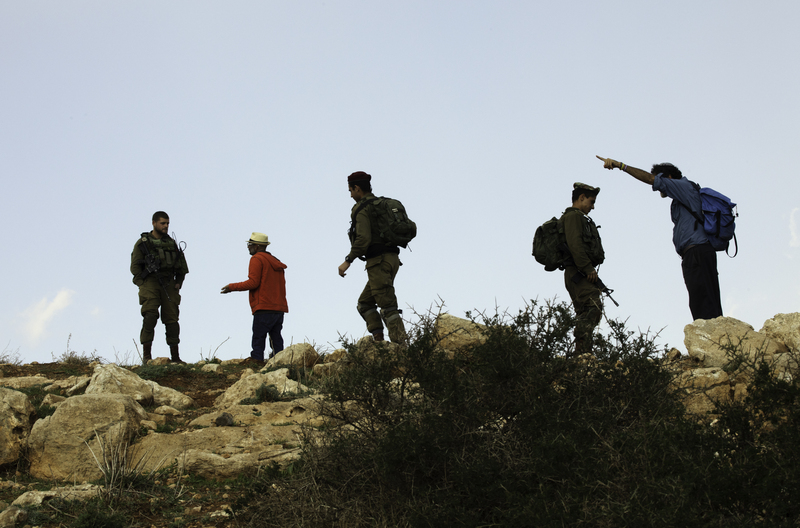 Later, some of us speculate that the soldiers let everyone be because they couldn’t see the Bedouins. 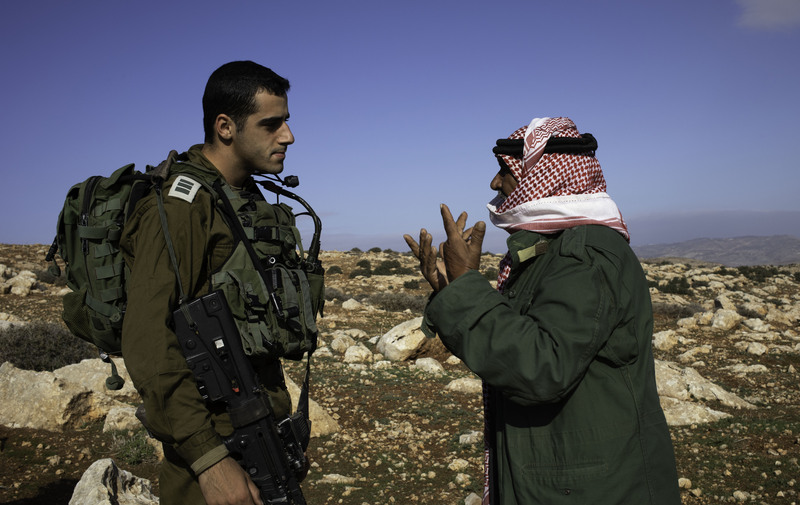 A visible Bedouin can potentially rouse instinctive rage in an officer of the occupation, but an invisible one inspires no reaction, any more than does the everyday barbarism of the occupation in a populace that fails to see any of it. Or perhaps he was just tired of being surrounded by beauty. Laurie – Thank you – for reading, supporting, sharing. I enjoyed your essay, and amazed at the landscape – it is all so green after the rains! Phenomenal pictures – landscape and close- ups.